For more, check out our list of the best Fallout 4 mods so far, and the Fallout 4 console commands. Fallout 4 has only been out for a few days, but there's already a lot of really cool stuff happening on the mod scene. 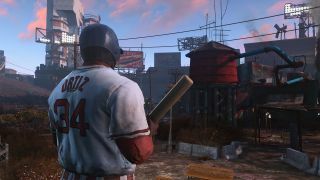 One of the coolest has to be the "Boston Red Sox Uniforms" mod, which lets you jump into the game as famed Red Sox slugger David Ortiz. I don't know if it's entirely in keeping with the post-apocalyptic theme, but this video of Big Papi teeing off on a bunch of raiders is easily the best thing I've seen today. Sadly, the suits at Major League Baseball don't share that sentiment. "The use of these marks is an infringement of our rights," an MLB rep told the Boston Globe. "We plan to enforce those rights." The maker of the mod, Richie Branson, said he was surprised by the reaction, because plenty of other Sox touchstones, including Fenway Park and the Green Monster, are in the game. He's also not making any money on it. "I'm putting a free Red Sox graphic into a game that already insinuates the Red Sox are in the game, at Fenway Park," he said. For now, the mod remains available on the Nexus, and Branson seemed cautiously hopeful that MLB would ultimately let it slide. "It would be in bad taste for them [to force its removal]," he said. "We know Ortiz is not a zombie-killing, post-apocalyptic warrior. And that's what makes it funny." But if MLB tells him to take it down, he will. "I'm not rich enough to even think about taking it to court." In other words, grab it while you can.